On my recent visit to Canada, I was confronted by the growing strength and public acceptance of the Israel Apartheid Week (IAW) and came back to Israel with new friends who take a courageous stance for Israel - The First Nations communities. From January 25th to 31st I traveled to Winnipeg and Ottawa, invited and sponsored by Bnai Brit of Canada in Winnipeg, CAMERA, Hillel, and the Israeli Consulate in Ottawa. During this speaking tour I experienced the PR campaign leading up to the anti - Israeli festival " Israel Apartheid Week ", which will be held in 92 cities around the world from February 20th to March 11th, and in Canada from March 5th to 9th, 2012. Finding New Israel SupportersOn Wednesday, January 25th, I gave a multimedia presentation in Winnipeg for the Bnai Brit Jewish/Aboriginal/Christian Round Table that included Jewish, Christian, and First Nation representatives and met many remarkable people at this meeting, including Rev. Raymond MacLean. Rev. 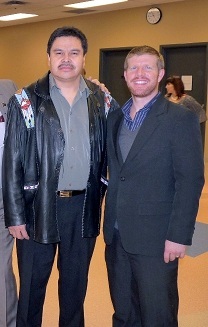 MacLean is a First Nation representative and Pastor to the largest urban First Nation community in North America. 10% of Winnipeg city's population of 700,000 is Aboriginal/First Nations people. 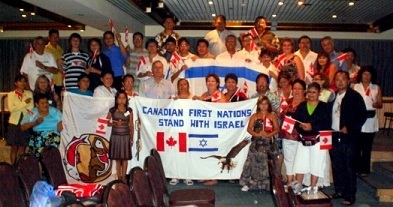 "Original peoples from both the northern and the southern ends of the earth" from Greenlandic Inuit, Canadian Inuit, First Nations from Canada, as well as indigenous people from Fiji, Samoa, New Zealand and Australia "Wherever we stand, we stand for Israel"
The Indigenous Tour to Israel as promoted in Winnipeg:There are fifteen First Nation communities from four Provinces in Manitoba, Alberta Ontario, and Saskatchewan, including representatives from the Objiway, Cree, Oji-Cree and Sioux tribes. More than 300 First Nation individuals have visited Israel in the past 9 years. The beautiful connection the First Nation people have with the Jewish people's rights to live in Israel, is summed up as “the inheritance of the land by the ancestors"
I asked Rev. MacLean to comment on how anti-Israel activists compare the Arab-Israeli conflict to “the Colonizer occupying land and kicking out the First Nations to live in poverty and in refugee camps". Rev. MacLean: " Our conflicts are not the same. They need to study history a little further. I know the history from the beginning. There were Arab nomads who lived in the Holy Land prior to the establishment of the State of Israel in 1948 who were hired by the new Jewish settlers. Also, neighboring Arabs from Jordan, Syria, Lebanon, Saudi Arabia, and Egypt sought employment and were hired by the Jews who were settling in their new land after returning from exile after 2500 years to reclaim their inheritance left by the ancestors. These Arabs became known as Palestinians but were originally Arab nomads and neighbors of Israel who Israel endorsed and recognized as Israeli citizens."